I grew up in a musical family. My father played guitar, my grandfather played, and so did my cousins. I remember family jam sessions happening in the basement of my grandparents’ house and I remember the day that a guy named Dan from the St. Charles Guitar Exchange started coming around. 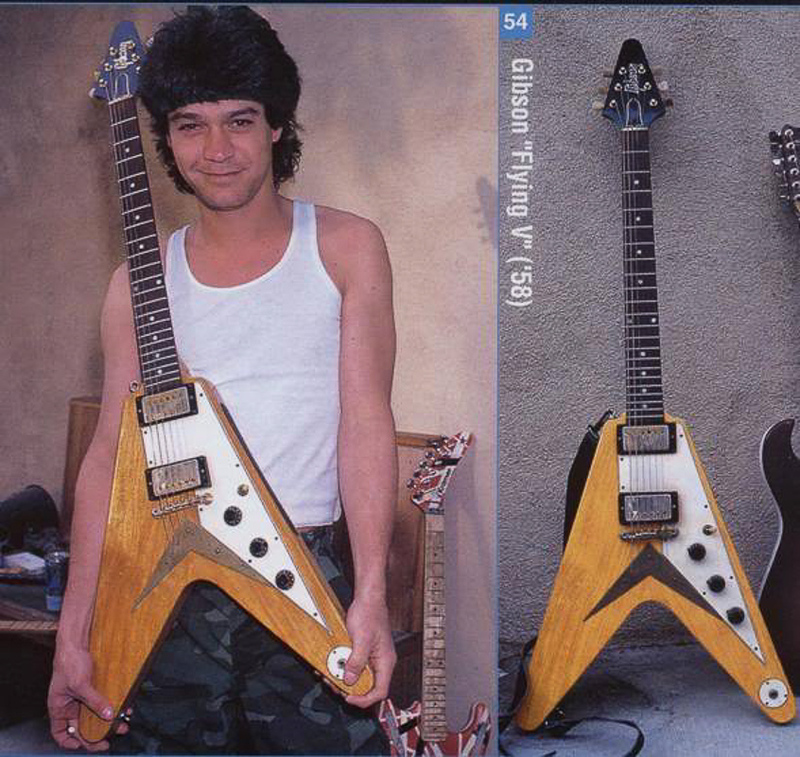 My grandfather owned one of the original 12 prototypes of the original Gibson Flying V guitar and Dan would stop at nothing to acquire this guitar. Dan lied to my grandfather’s face for a profit and to begin what would become a very lucrative guitar acquisition project for none other than Eddie Van Halen himself. I was pretty young when all of this happened but my family knows the story all too well and here’s how it goes. My grandfather had purchased the guitar new from a music store in south St Louis. It was sitting in a window and he liked the looks of it. The guy told him it was a special breed of guitar that Gibson was trying out but that Gibson was not going to produce them. I believe there were only about 12 of the prototypes made and I think there are only 3 or 4 of those still in existence. 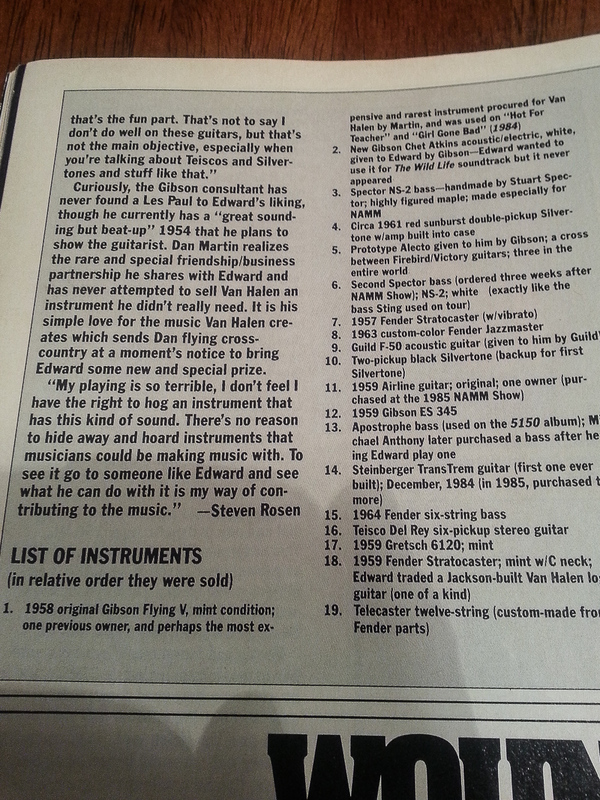 It was mid 1980 when Dan first approached my grandfather about the super rare instrument. Dan showed up on my grandfather’s doorstep, got on his knees and begged for the guitar. He promised my grandfather a White Falcon guitar, another Gibson collectible, and said he could deliver on that promise with no problem. Dan then came back again begging on his knees when he could not deliver the Falcon. As for the V, my grandfather ended up accepting the offer for the red Gretsch and Gibson stereo amp once Dan promised he was just collecting it and it would stay under his mom’s bed at her house, and that grandpa could play it anytime he wanted to. Turns out my grandfather didn’t really care for the sound of the Gretsch and in about 6 months took it back to Dan and got the red Gibson BB King Lucille. When he returned to see Dan he discovered that Dan had flat out lied to him and sold the guitar to Eddie Van Halen for a reported ten thousand dollars. It would be the first guitar that he sold to Van Halen which would lead to many more deals to follow. My grandfather regretted getting rid of the V because nothing ever played as nice as the V he said. I regret the fact that Dan essentially stole a priceless guitar from my family to make a quick buck and impress a rock star. In fact, the 1958-59 korina Flying V is one of the most expensive guitars on the vintage market valued between $200,000 and $250,000. At the end of the day I would guess that Van Halen had no idea about the deceitful way that Dan had “acquired” the guitar and the promises that were broken. I just wanted to set the record straight and tell the truth about a guitar that I would have loved to see stay with my family. Thanks for the comment Dave. This is the very first time that the story has been told. As I mentioned I would guess that Eddie has no idea that Dan was such a deceitful liar, but it would be nice for him to know the story. sad but crying over spilt milk don’t do anything. 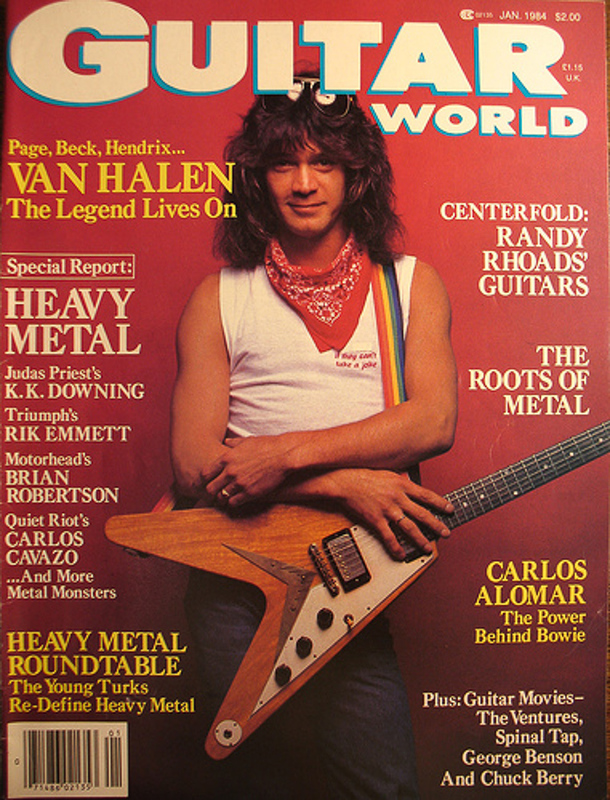 your issue is with the dealer not mr. van halen. so a title of how he stole your grandfathers guitar is inapropriate. The title is appropriate under the circumstances and the story needs to be told. There are way too many articles praising the dealer in this case without any back-story. The fact that Mr. Van Halen got this guitar because a shady dealer blatantly lied to a good family in order to build a relationship for profit is something Eddie needs to be aware of. Whether or not he takes action, which he has not, is another thing. Sorry for your grandpa. That dealer guy has no honor. But you know what they say about oral agreements, they’re worth about as much as the paper they’re written on! Dan was a shady dealer who would say anything and lie through his teeth to get this guitar. That’s the bottom line. This story needs to be out there and now it is. I knew Dan Martin. Bought my first amp from the guy. He died a few years back. I found this story to be pretty typical.After Dan passed I ended up running across a couple pieces from his collection …one being one of Eds handpainted 5150 style guitars….I went way out of my way to get the guitar back to Ed thinking it may be special to him. Let’s just say the description above of Dan…..sounds like the same guy I was presented with when meeting Ed. I’m sure the guy was at one time blessed with a better personality when he still had his soul intact. But all I found was a shell of what may have been. I had a ’57 Les Paul Goldtop that I had under my bed for years in Colorado. I moved to California in ’87 and needed cash and went to a local guitar store in San Marcos. I wanted to get it appraised first. The owner said it was only worth $600. I really needed the cash and took the deal. I later found out I was ripped of. The music store went out of business and I later found out it was sold to an east coast artist and loves the guitar and cherishes it. I at least feel good that a good person got it and respects it. 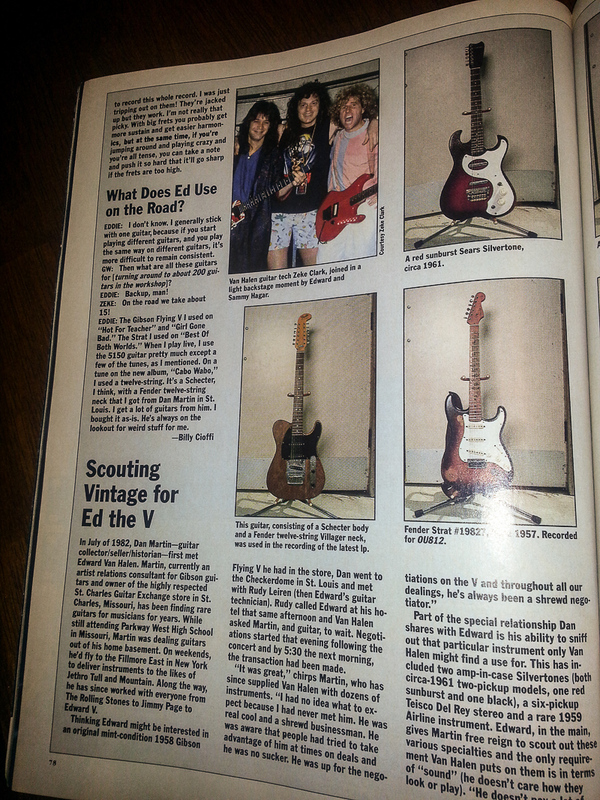 I find this article interesting as I have two early guitars of EVH from before he & the group went on their first US tour in ’78. The main reason was because they sold as much gear as they could to get as much money as they could gather in preparation for it. One of the guitars is a custom built all zebra wood flying V w/ old vintage Gibson pickups, a wide and concave extra thick ebony fret board (ala classical guitar fret boards), jumbo frets, and a huge brass nut. It still has the holes in the body from his unorthodox method of using eyebolts for strap locks! I often wonder if he would ever remember having it and if he’d ever want to play it again? 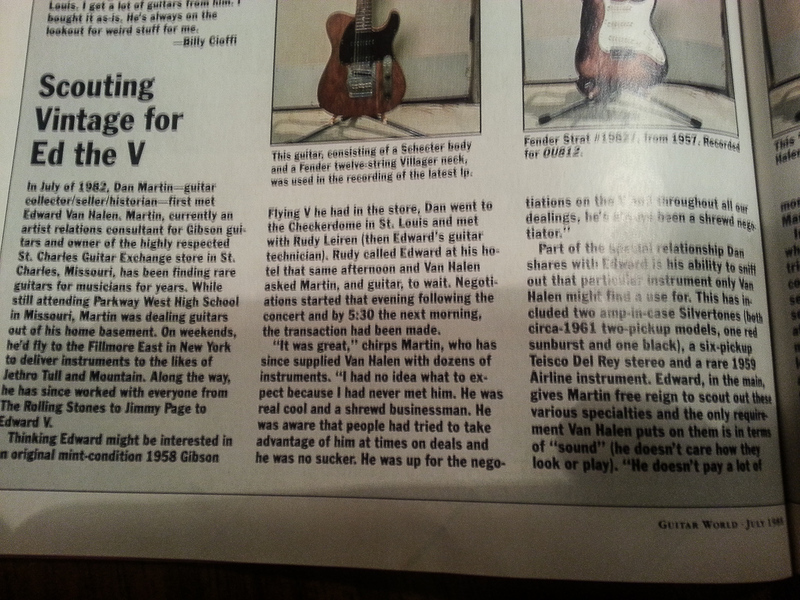 Especially now that I see this article about his fondness for another flying V not too long after letting that one go? I also still have a photo of him playing (and still developing?) his tapping technique on it. I worked for Dan for over 10 years. I played that guitar when Dan was going to sell it to Pete Townshend of the Who before he sold it to Ed. It was an amazing guitar. But, the story he told me of how he got it is different than what you have told and I completely agree with your version. He was a megalomaniac and I habitual liar. I’m sorry that your family was deceived by him. Sadly, yours was not the last. Wow. It’s really sad that your grandfather was scammed out of such a priceless guitar, but at least it ended up in some very talented hands. In an aside, I have to say that I’m really impressed with how well the band is doing. I read that they’re on tour this summer, which is super exciting. Dan passed away a few years ago, Guitar exchange closed. Dan was a friend of mine, I grew up in St. Charles. Sorry your grandfather lost the “v”, but it’s business. Not personal. Could you think of a better person to hold on to the guitar? Bet Eddie plays better anyway. Calling Dan a “swindler” is just wrong. Thanks for the comment, but this happened on more than one occasion. And I completely disagree with you because this is not how honest people do business, and it was VERY personal in this case. I played this guitar before Van Halen bought it. I gave guitar lessons ar guitar exchange when I was like 18. Dan told me he was selling it to Van Halen. I did not know anything about how he got it. Dan use to go to estate sales and would talk about deals he would get. I bought several guitars from him. Like five years after I worked there I went to Dan with my mother in law to find a guitar for my father in law. He plays left handed so Dan was on the look out for one. 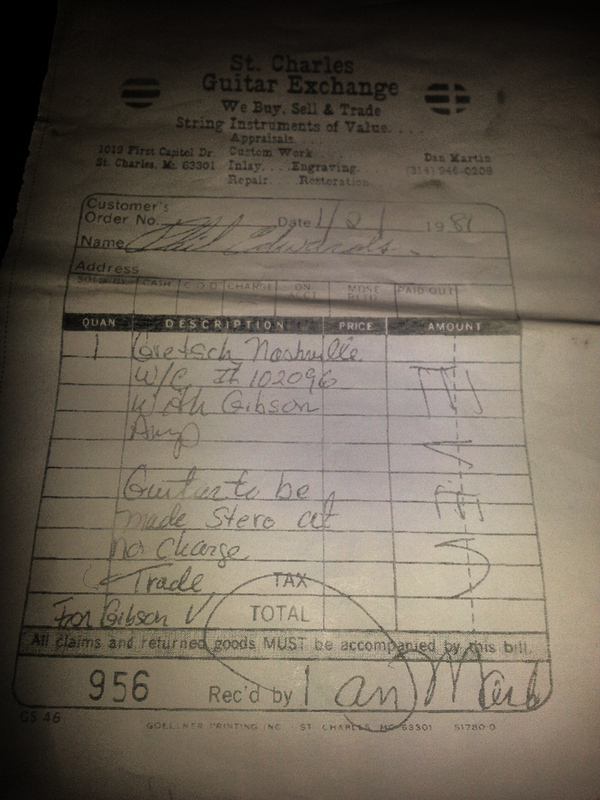 He found us a Gibson left handed acoustic and sold it to us for $300. Like I said I was young. After the years went by my father in law could not play it anymore so I bought it from him and had it switched to right handed. When I looked at it after gaining some wisdom i noticed it was made at Kalamazoo and it had an epiphone body and Gibson neck. It was originally right handed. Had some different knowledgeable people look at it and they think so random worker at Gibson made it. Well it is one of a kind.